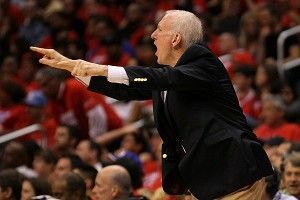 When commentators and analysts look back at the San Antonio Spurs’ sweep of the Los Angeles Clippers, many of them will focus on the Spurs’ 24-0 run from Game 3. But they were successful because they continually out-executed the Clippers on offense, not just during the one run. In the second half of each game, we saw the Spurs perfectly execute one of coach Gregg Popovich’s set plays just when they needed it. The play begins with Tony Parker receiving the ball on the sideline and dribbling to the middle as soon as he crosses half court. Manu Ginobili shoots up to meet Parker and offer him a passing lane. Once Ginobili makes the catch, Boris Diaw comes over to set a “step-up” screen for him. A step-up screen differs from a standard screen in that it’s not used to get the ball handler to the middle of the court. 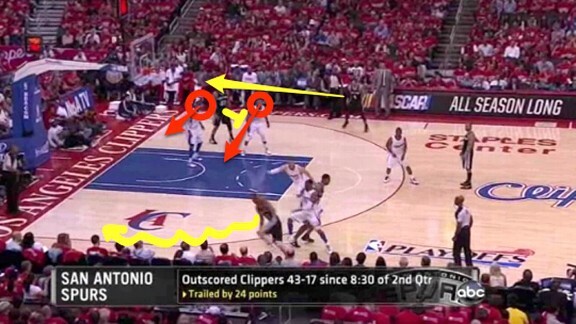 Rather, it was set on the other side to allow Ginobili to attack the baseline. 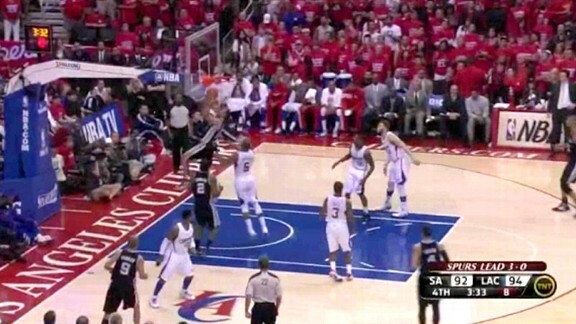 As Ginobili heads toward the corner, the play start San Antonio intends on develops. With the two weakside defenders focusing on Ginobili, Tim Duncan can sneak behind Green’s man to set a screen off of the ball. Green uses that screen and flares to the corner, awaiting a pass. 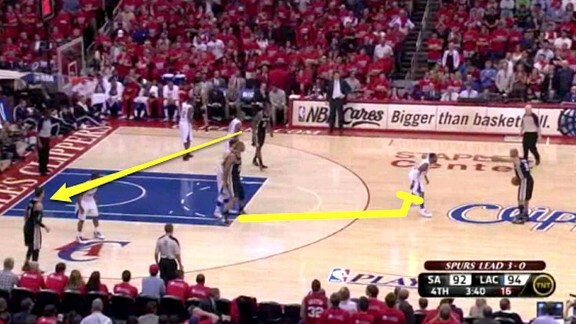 Popovich and the Spurs repeatedly rely upon misdirection and weakside action, and this set was a perfect example. Even though they are running a step-up screen on the strong side, the main action is actually the screen Duncan sets for Green, which resulted in a wide-open 3. Parker brings the ball down the court with the Spurs in a “horns” formation — the two bigs set up on the elbows and the guards set up in the corner. 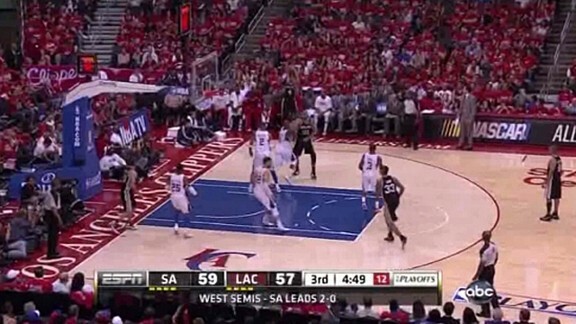 As soon as Parker gets in position, Kawhi Leonard moves to the opposite block, taking his defender with him. As that happens, Duncan sets a ball screen for Parker up top. Duncan does his best David West impression and leaves the screen, flaring out behind the 3-point line without actually making contact on the screen. Instead of probing, Parker quickly gets the ball into Duncan’s hands. 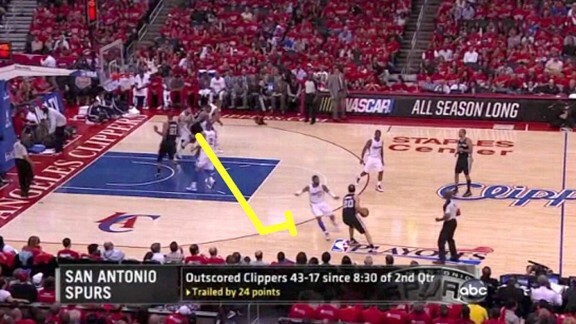 That should be a red flag for the Clippers: The Spurs are up to something. Only Duncan and Ginobili remain on the strong side, so the Spurs can play their two-man game. Duncan dribbles at Ginobili as Ginobili starts toward Duncan. This is where Ginobili gets to read and react to the defense. 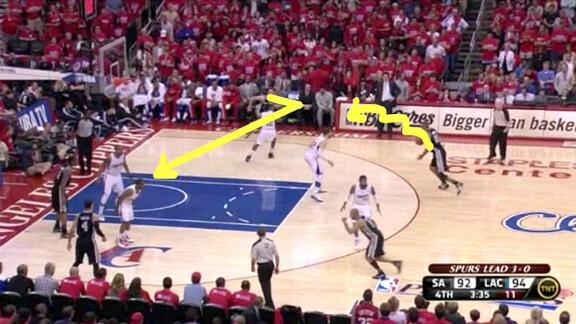 If they are playing off of Ginobili, he will come over to Duncan for the dribble handoff. 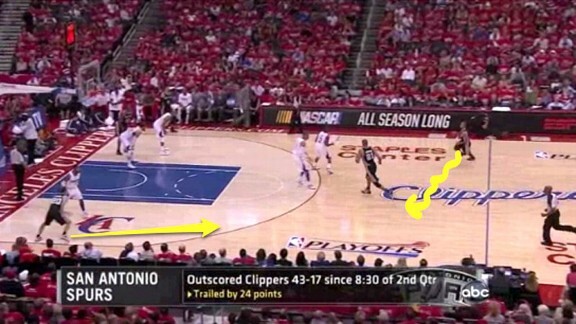 If they overplay the handoff — which happens here — Ginobili will cut backdoor. Duncan, aware of Ginobili’s two options, hits him with a pretty pass. What’s great about this play is the anticipation and timing. Parker knows that he needs to get the ball to Duncan quickly and does so; Duncan knows that if the defense overplays Ginobili, he will cut backdoor and expect a pass from Duncan. 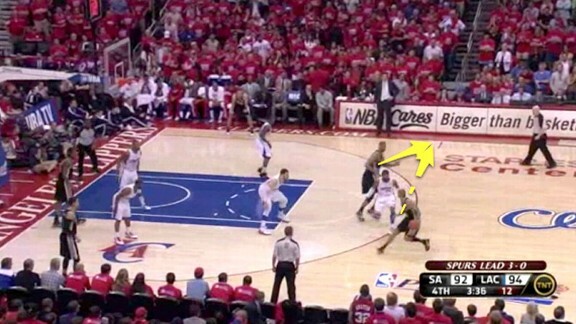 If Popovich continues to draw up plays like this, the Spurs will be tough to beat.